Welcome to our jam packed page, full of dolls and toys from Dreamworks utterly beautiful animation, Rise of the Guardians. Personally, this is up there as one of my favourite animations of all time. I fell in love with it from the moment I saw it at the movies. Not only does it have Father Christmas (and who the blinky blonky doesn't love a good Santa movie?? ), it also has the Easter Bunny (voiced by Hugh Jackman, no less), but it also firmly acquaints us with one of the lesser revered childhood heroes, Jack Frost. As you can tell from artwork, the characters are absolutely beautiful...and as everyone at AnimatedMovieDolls.com knows, with every great animation, comes even greater character dolls and toys! 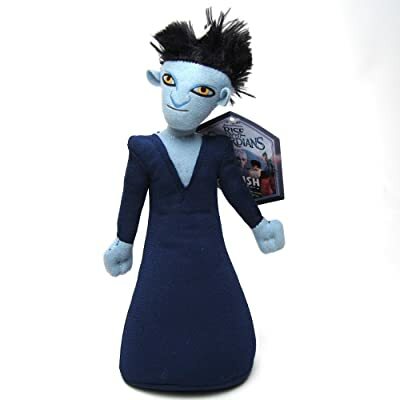 If you're an eager beaver and can't wait to browse through the gorgeous treasure of Guardian dolls, you can go straight to Amazon.com's page dedicated to the best dolls from Rise of the Guardians here, right now! Be sure to bookmark this page, and heck, why not share it on your favourite social media site...or if you on twitter, tell everyone to visit us - or just come say hello! Ahhhh...it's Santa! Well, he goes by the name of North here, in Rise of the Guardians. In the movie, voiced by Alec Baldwin, this character is tough! What I really love about Rise of the Guardians, is the way they make North, the Father Christmas character, almost like a warrior - as someone who can really protect children! I mean, have you seen his tattoos? 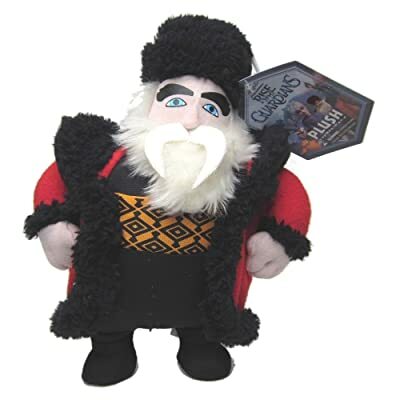 This plush doll will looked after well by fans of the movie, or for any avid movie memorabilia collection. Vote for your favourite Guardian! Soooo, who's it to be? Who's your favourite Guardian? Is it Jack Frost himself, voiced by the very talented Chris Pine. Or perhaps you're a fan of North, the big "jolly" Santa Character. or the cute, you might the Easter Bunny...or even the Sandman! Or are you the Jude Law loving, Pitch?? Oooo, it's Pitch! Or perhaps, more commonly known as the Boogieman! It's amazing how someone so nasty, can be voiced by someone who seems so friendly...of course, we're talking about the dashingly handsome, Jude Law! Well...if we go by the reviews on Amazon, this plush Pitch isn't going down so well. Soooooo, if you really like the character, or if you're a massive Rise of the Guardians fan, then of course, this would be fab in your collection - however, you might prefer something that receives better reviews, such as the (ever fabulous) McDonalds Happy Meal toys, which you can still get from Amazon (and featured a bit further down this page). Check out this gorgeous trailer for Rise of the Guardians...in case you haven't seen the movie yet! 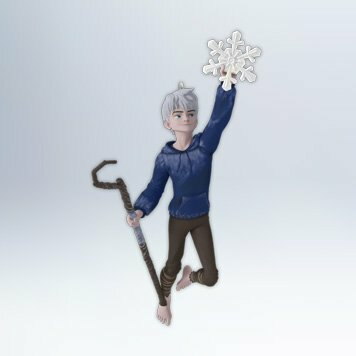 I just absolutely adore this Jack Frost ornament. For me, this guy represents everything that is special and magical about childhood, and believing in those fantastic characters we all know and love...and what could be more magical, than adding this fantastic piece to your Christmas tree. Bringing a sense of charm, and frosty flavour to your Christmas decor, this simple, yet gorgeous ornament gets five star reviews on Amazon.com - so what are you waiting for! Get this fab piece into your shopping basket now! Rise of the Guardians, McDonalds happy Meal Toys! To be honest, I'm really not a fan of McDonalds...I find their food kinda disgusting. However, what they lack in satisfying culinary offerings, they more than make up for with their utterly fantastic Happy Meal toys. McDonalds released Rise of the Guardian edition Happy Meal toys back in 2012, but you can still get them from Amazon. Quite often, they are sold by smaller retailers, or private sellers on Amazon, so just be aware that they might not always be available, and their prices can vary considerable. I've seen them sell for as much as $25 and as little as $0.25!! So, if they're out of stock when you shop, keep checking back, as more stock gets added all the time! More dolls & Toys you will love! AnimatedMovieDolls.com is updated all the time, with all the latest dolls, from all the latest animated movies! Why not have a browse through many of our other pages, waiting for you!